I believe that there is no such thing as a bad brownie, nor is there such thing as “the best” brownie. But there is such a thing as an extremely moist, perfect, delicious, melt-in-your mouth, oh-la-la brownie. Say hello to the Baked brownie. I brought these in for the Club Fair to promote the Baking Club (everyone who signed up got to take whatever they wanted from our array of baked goods). Guess what went first? Not the double espresso cupcakes, not the pumpkin bread, not even the gooey butter cookies! These brownies. My friend Erin ate three before I could even finished putting our poster up! Bewildered little freshman boys started asking for the recipe. Even my merciless P.E. teacher cracked a smile after taking a bite out of these. These are a favorite of Oprah, America’s Test Kitchen, my school’s soccer team, and the security guard on level 2. They are soon to be a favorite of yours too. pan. The mixture should be room temperature. until just a bit of the flour mixture is visible. parchment paper. Cut into squares and serve. 7. Store at room temperature in an airtight container or wrap with plastic wrap for up to 3 days. They also freeze quite well. How many squares does this recipe make? So it really depends on the occasion! omg omg omg I need to make these ASAP! I've had the recipe sitting around, waiting for me, and now's the time. Those need to be the next thing I make! I hope you make them too! Tell me how they turn out! I loooove your blog!! I'm also in high school! These look so good. I will definetly be making them! Thank you so much! I love to meet other high-school foodies out there 🙂 Shoot me an email sometime! A recipe from Baked. will definitely win me over! I can't wait to make these! So it is cakey and fudgy? Which is it more of, cakey or fugdy? I cannot believe the computer still can't accept the terms 'cakey' and 'fudgy' as a word. Hate seeing that red zig zaggy line. Yep there it goes again. I know exactly what you mean about the zig-zag line! (I just got one for writing the word zig-zag… AAHHHHH). 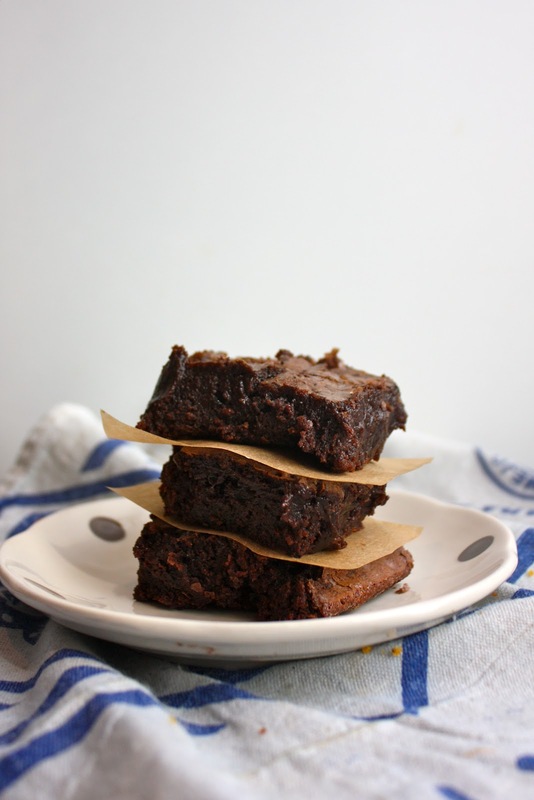 It is definitely a fudgy brownie, but not as fudgy as the David Lebovitz version that I used to make (with only a few tablespoons of flour!). Honestly, I am not the biggest fan of cakey brownies — if you want a cakey brownie, why not just eat a piece of chocolate cake? So these are definitely on the fudgy end of the spectrum.